“Skills of the ‘Unskilled': Work and Mobility among Mexican Migrants” is the co-winner of the 2016 book award of the Inequality, Poverty, and Mobility Section of the American Sociological Association. UCLA International Institute, June 24, 2016 — The most recent book of Rubén Hernández-León, “Skills of the ‘Unskilled’: Work and Mobility among Mexican Migrants” (with Jacqueline Hagan and Jean-Luc Demonsant / University of California), is the co-winner of the 2016 book award of the Inequality, Poverty, and Mobility (IPM) Section of the American Sociological Association (ASA). 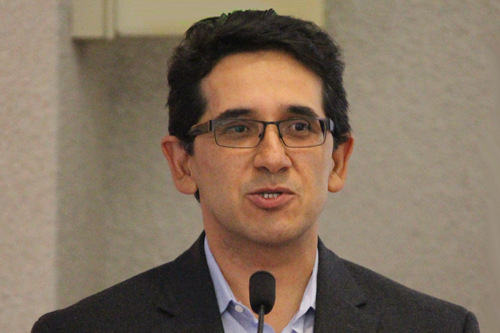 Hernández-León, director of the Center for Mexican Studies and professor of sociology at UCLA, will receive the award with his co-authors at the annual ASA conference in Seattle, to be held August 20–23. The IPM Section brings together ASA sociologists who share a research interest in the topics of inequality, poverty, and mobility. The group fosters research and disseminates knowledge on the distribution of material and nonmaterial resources, as well as the economic, social, and cultural forces that generate and perpetuate unequal distributions of these resources. “Skills of the ‘Unskilled’” was first published in March 2015 and has received excellent reviews in relevant scholarly journals. Based on a five-year study that encompassed interviews with 50 Mexican immigrant construction workers in the United States, as well as with 79 workers who returned from the United States to Mexico, plus a survey of 200 “return migrants” in the town of León, Mexico, the book traces the human capital formation of migrant workers over time, concluding that many so-called “unskilled” immigrant workers develop valuable skills that prove highly marketable upon their return to Mexico. The UCLA International Institute congratulates Professor Hernández-León on the IPM book award and wishes him much continued success.